This gothic Halloween table setting is an elegant way to celebrate the spookiest of holidays! This post is sponsored by Cost Plus World Market. All opinions are my own. Affiliate links have been included for your convenience. My birthday falls on November 1st, but since I was a kid, I’ve tried to celebrate it on Halloween – because it’s so much more fun! I’ve always been obsessed with everything Halloween and horror related. My idea of a great movie is a scary one – the creepier the better. Even as a kid, you would find me reading Goosebumps books, then Point Horror (remember those!?) and I eventually graduated to Stephen King. Every year, I have a new theme for my birthday party. Nowadays, as a mom to 2, my parties have evolved into “spooky” dinner parties but they are just as fun! I think Halloween is a great opportunity for everyone to play at being a kid again. Having the opportunity to decorate and bake/cook frightfully delightful treats and drinks is really a great time for me! This year’s Halloween Décor theme is “Elegant Gothic”. The starting point for this theme was these beautiful candelabras from Cost Plus World Market. I thought they were so grand and elegant. Placed atop a spider web tablecloth, they are the perfect centerpiece for my Halloween tablescape. You can’t go wrong with black at Halloween and these plates and stemless glasses really help to pull the whole gothic look together. My accent color for this tablescape is a pop of “blood red” which I chose to incorporate with these napkins which I placed on the plates with some dollar store vampire teeth to act as napkin rings. By the way – I had fun playing with a darker style of photography while doing this post. It’s certainly a different way of photographing from my usual light and bright style. Getting to really manipulate light and shadow was a whole new experience for me that I really enjoyed! The dollar store is my go-to for a lot of my tablescape extras – the black faux flowers, cheap vases (spray painted black! ), creepy crawlies and spooky birds. You can’t call it Halloween Entertaining without delicious food and drink, right? Simply toasting some thinly sliced baguettes, toasting them and adding goat cheese & fig preserves makes for a delicious finger food. Every party has to have cake. This chocolate bundt is one of my all-time favorites. I’ll be sharing the recipe for it shortly! Let’s get to the real star of the show – my Halloween Blackberry Sangria. 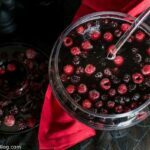 Made of red wine, raspberry liquer and plenty of blackberries and raspberries – this sangria is sweet, delicious and quite potent! The sangria is simple to make ahead of time and looks pretty when paired with sugar fruit. I served mine in a punch bowl but of course a pitcher would work, too. In a small saucepan, heat blackberries, sugar, and water over medium heat. Stir and crush blackberries with back of large spoon. Cook for 5 - 10 minutes or until reduced and sugar is completely dissolved. Pour mixture through and sift and strain. Discard pulp and seeds and let syrup cool completely. In a punch bowl or large pitcher, pour red wine, Chambord and blackberry simple syrup. Stir to combine. Gently add fruit and top with seltzer. Do you think a gothic Halloween tablescape is one you’ll try? I’d love to see your version if you do. Find me on Facebook and Instagram and share a photo! Jenna – this is so elegant and spooky! Love it all! love this table! It is so gorgeous and I am like you, LOVE Halloween!!! I’m thinking halloween dinner, or even murder mystery! Very nice tablescape! Ohhh I SO want to do a murder mystery!!! I love all of this! Halloween is such a fun holiday and decorating like this makes it even more special! Thank you for these spooktacular ideas! Love your ghoulish table! I love spooky movies too. On Halloween night I turn off all the lights, light a few candles to put in the windows for trick or treaters, and watch Friday the 13th while answering the door. Your sangria looks amazing and I have to give it a try! Great finds from World Market!! Love this!!! That sangria recipe looks so good!! Stunning, Jenna! I love how elegant and dark everything is. My kinda Halloween party! !